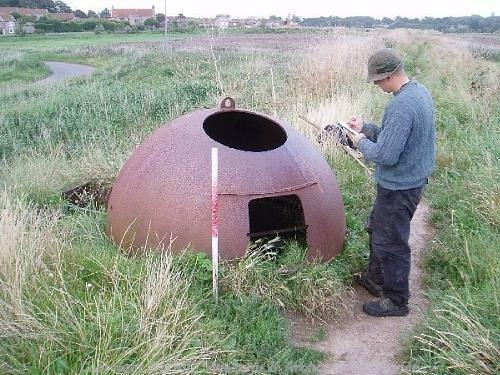 This World War Two Allan Williams Turret is embedded in the modern sea bank north of Cley next the Sea village. It would have functioned as a gun emplacement and is visible on aerial photographs taken in 1994. Cupola, World War Two. Iron dome with offcentre port in one side; lifting ring on top. Gun mounting inside. Revolves on three iron wheels on iron circular lower section, containing seat; iron lined tunnel from exterior. E. Rose (NAU), 21 November 1987. E. Rose (NLA), 29 May 1994. See (S1) in file, which adds: Very rare Allan Williams Turret, designed to mount Lewis gun in either anti aircraft or ground role. Date 1940. Survey No. D1-3. In very good condition. World War Two pillbox just visible on Ordance Survey aerial photographs from 1994 (S2). H. Clare (NMP), 7 April 2003. No change, except full of rubbish. E. Rose (NLA), 8 December 2003. May to November 2004. Norfolk Rapid Coastal Survey. Context 889. The Allan Williams turret was made from two steel sections. The lower was cylindrical with an entrance and was partly embedded in the modern sea bank. The upper was dome shaped. J. Allen (NLA), 20 April 2005. <S2> Aerial Photograph: Ordnance Survey. 1994. OS/94172 007-9 14-JUN-1994.